This week Trans​me​diale​.de organ­ised a Magic­al Secrecy Tour around Ber­lin to mark the anniversary of Edward Snowden’s world-chan­ging dis­clos­ures. And what bet­ter place to hold such a tour? Ber­lin has long been the play­ground for inter­na­tion­al spies, fight­ing the old Cold War in the dirty dark. It also still bears the scars of two total­it­ari­an regimes run out of con­trol — the brute force of the Nazis and the insi­di­ous sur­veil­lance of the Stasi dur­ing the years of the DDR in East Ger­many. It is a city that is a liv­ing museum, and the tour took us around some key points, includ­ing the old Stasi HQ — now a museum — the new bil­lion euro BND mega-com­plex, the Spy Bridge, and the Spy Hill. It was a stark les­son from his­tory about what spies could do, should do, and are now doing in the mod­ern day. Ber­lin Magic­al Secrecy Tour from Annie Machon on Vimeo. With huge thanks to Kris­tof­fer and the rest of the Trans­me­diale team for an inter­est­ing day. Here is my RT inter­view yes­ter­day about the Wool­wich attack. A hor­rif­ic murder and my thoughts are with the fam­ily of the poor vic­tim. That said, the Brit­ish and Amer­ic­an gov­ern­ments and the NATO coun­tries are disin­genu­ous of they think that their strategy of viol­ent inter­ven­tion­ism across North Africa, the Middle East and Cent­ral Asia will have no con­sequences. As a res­ult of our illeg­al wars, CIA kill lists and drone strikes, count­less fam­il­ies are suf­fer­ing such trauma, viol­ence and loss across the region every day. RT inter­view: Lone-wolf attack to become main expres­sion of rad­ic­al­isa­tion? from Annie Machon on Vimeo. My recent inter­view on Iceland’s premi­er news dis­cus­sion show, Sil­fur Egils, hos­ted by the excel­lent Egill Hel­gas­on. The name refers to an old Norse saga about a hero, an earli­er Egill, throw­ing hand­fuls of sil­ver to the ground so he could make the Vik­ing politicos of the day scrabble around in the dirt try­ing to pick up the coins. Well, this will be an inter­est­ing week. On the invit­a­tion of Snar­rot­in, the Iceland­ic civil liber­ties organ­isa­tion, I’m off to Ice­land for a series of talks and inter­views on behalf of Law Enforce­ment Against Pro­hib­i­tion (www​.leap​.cc). Ice­land is an inspir­a­tion­al and inter­est­ing coun­try. Fol­low­ing the 2008 cred­it crash, the Icelanders bucked inter­na­tion­al trends and actu­ally held some of their rul­ing élite — the politi­cians and bankers who had brought about these fin­an­cial prob­lems — to account. The gov­ern­ment fell, some bankers were fired and pro­sec­uted, and the Iceland­ic people are hav­ing a ser­i­ous rethink about the way their demo­cracy could and should work. And indeed why should the people pay the price for the decisions made in their name by an unac­count­able élite? One could spe­ciously argue that the people had a mean­ing­ful choice at the bal­lot box.… but back in the real, 21st cen­tury polit­ic­al world, Ice­land was as stitched-up as all oth­er notion­al West­ern demo­cra­cies. The worst alleg­a­tion that can be thrown at the people was that they were dis­en­gaged, unin­volved and side­lined from how their coun­try was really run — as many of us across the West feel to this day. But appar­ently no longer in Ice­land: since the fin­an­cial crisis the cit­izens of this small demo­cracy have re-engaged in the polit­ic­al pro­cess, and the future is look­ing rosy. New, account­able politi­cians have been elec­ted to form a new gov­ern­ment. Cit­izens have been involved in draw­ing up a new con­sti­tu­tion, and heated debates are chal­len­ging the estab­lished shib­boleths of the cor­por­at­ist gov­ern­ing class: revolving around such issues as fin­ance, inter­net freedoms, free media, ter­ror­ism, and how a mod­ern coun­try should be run in the interest of the many. And next week, I hope, a rethink of the country’s oblig­a­tions to the inter­na­tion­al “war on drugs”. While the issue is strenu­ously ignored by the West­ern gov­ern­ing élite, it is now widely recog­nised that the cur­rent pro­hib­i­tion strategy has failed out­right: drug traf­fick­ing and use has increased, the street price of drugs has plummeted and they are endem­ic­ally avail­able, whole com­munit­ies have been imprisoned, whole coun­tries have become narco-states and des­cen­ded into drug war viol­ence, and the only people to profit are the organ­ised crime car­tels and ter­ror­ist organ­isa­tions that reap vast profits. Oh, and of course the banks kept afloat with dirty drug money, the mil­it­ar­ised drug enforce­ment agen­cies, and the politi­cians who now, hypo­crit­ic­ally, want to look “tough on crime” des­pite alleg­a­tions that they also dabbled in their youth.…. Well, the time has come for an adult dis­cus­sion about this failed policy, using facts and not just empty rhet­or­ic. So, a week dis­cuss­ing all my favour­ite happy top­ics: the “war” on drugs, the “war” on ter­ror, and the “war” on the inter­net. My type of mini-break! Canada was great — the first nation­al speak­ing tour organ­ised by the country’s 9/11 groups. And before you roll your eyes, these are cit­izens’ groups that are call­ing for a new enquiry — in response to a moun­tain of evid­ence from hun­dreds of cred­ible experts around the world, who ques­tion the offi­cial account peddled by the 9/11 Com­mis­sion. Bear­ing in mind how the issue of 9/11 has been used and abused by our dear gov­ern­ments to jus­ti­fy the end­less “war on ter­ror”, the use of tor­ture, the wars in the Middle East and the erosion of our freedoms at home, I think any con­cerned and respons­ible cit­izen should, at the very least, keep an open mind about this issue and do their own research. 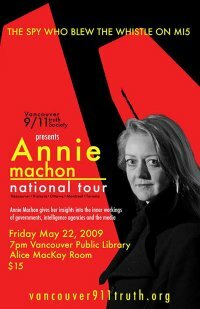 Espe­cially as the 9/11 Com­mis­sion was, in the words of its two chairs, Keane and Hamilton, “set up to fail”! But back to the tour. Huge thanks go to Patrick, the nation­al organ­iser of the tour, who had the vis­ion and com­mit­ment to pull the whole thing togeth­er, as well as sort out all the logist­ics and arrange a con­stant flow of media inter­views for me, of which more below. And of course to the organ­isers of the events: Eliza­beth, Ruk­shana, Mark, JF, Michael, Adam, Adnan, Graeme, and all the oth­er act­iv­ists — too many to name indi­vidu­ally. I had to fly to Van­couver via Chica­go O’Hare, which spooked me to begin with. I’ve been through that air­port before and it has, in the past, lived up to its well-deserved repu­ta­tion for power-crazed immig­ra­tion officers. How­ever, I got a real sweetie — we ended up hav­ing an inter­est­ing chat about the nature of demo­cracy, before he cracked a smile and waved me through. In com­par­is­on, Van­couver air­port is a Zen exper­i­ence — all nat­ive art install­a­tions and water­falls. As I emerged blink­ing into the late after­noon sun­shine (it was about 3am by my body clock), I was greeted by the Van­couver posse and whisked away in the Truth Bus to food, wine and anoth­er radio inter­view. At the end of the after­noon, I had a fab time being inter­viewed on Van­couver 1410 CFUN driv­e­time radio, before one more tele­phone inter­view and a well-earned glass of cham­pagne at Geor­gina and Darren’s. After this day of recov­ery, I was then invited onto the Bill Good Show the next morn­ing. Bill is the grand old man of BC media, and he was a excel­lent inter­view­er. I had half an hour with him, and the show went out to over a quarter of a mil­lion people. The meet­ing that night was a great suc­cess — I could feel the energy and interest of the audi­ence as I spoke for 1 1/2 hours, and then had over an hour more of ques­tions. I think it’s wrong for the media to say people are no longer inter­ested in polit­ics — they’re just not that inter­ested in the estab­lished polit­ic­al hier­arch­ies and sys­tems. I had a lovely couple of days in Vic­tor­ia, pampered by Eliza­beth and Bri­an, shown the beau­ties of the island and meet­ing a num­ber of act­iv­ists. I also had the pleas­ure of meet­ing Row­land Mor­gan, (co-author with Ian Hen­shall) of the excel­lent best­seller, “9/11 Revealed”. I’d done a num­ber of inter­views before arriv­ing on the island. The Vic­tor­ia event was very well atten­ded and I had a stand­ing ova­tion at the end. Then it was back to Van­couver for anoth­er hour-long inter­view on Co-op Radio and a pot luck sup­per with the act­iv­ists, before fly­ing off to Ott­awa for the east­ern leg of the tour. I arrived at mid­night to be greeted by the lovely Mar­jor­ie and Cam, who hos­ted me for a couple of nights. My sleep was all too brief, as I had to get up at 4.30 to make a 6am radio inter­view. The Ott­awa event was smal­ler (I would say it was an extremely rainy night! ), but per­fectly formed. Des­pite this, the group seemed very enthused about put­ting on future events. The next day brought a Grey­hound bus ride up to Mon­tréal. Such moments in life are when you wish you’d put Simon and Gar­funkel on your I-pod. My 18 hours in Mon­tréal were hec­tic — and we only just made it to the meet­ing on time, what with an excel­lent din­ner and ter­rible traffic. The meet­ing was really vibrant. After­wards, when every­one else was head­ing out to party, I had to slink back to my bed for a brief 4 hours sleep, before get­ting a train at 6.30 to Toronto. I hit the ground run­ning, with a lunch­time inter­view, then a peace demo in the city centre. Clin­ton and Bush Jr were in town, giv­ing a talk to 5000 of the faith­ful who were flush enough to cough up between $200 and $5000 to hear their bien pensees. Inde­pend­ent media did a couple of good inter­views with me. Shame­fully, the Stop the War Toronto group only man­aged to rustle up about 1,000 pro­test­ers out­side the con­fer­ence centre, and then refused to give a plat­form to Split­ting the Sky, a Cana­dian peace act­iv­ist who had attemp­ted to arrest Bush for war crimes when he vis­ited Cal­gary in April, and who had him­self been arres­ted for his pains. How­ever, some oth­er peace act­iv­ists had some good cov­er­age! The next day, hav­ing caught up on some sleep at last, I had an excel­lent time at the Toronto uni­ver­sity radio sta­tion, where we had a lively hour-long inter­view, before head­ing off to my event at the uni­ver­sity. Next stop, Water­loo Uni­ver­sity, where I did a round of inter­views accom­pan­ied by the journ­al­ist and cam­paign­er, Bar­rie Zwick­er. The format that night changed to an inter­view on stage con­duc­ted by him, which worked really well. The final stop of the tour was Hamilton where, after anoth­er all-too-brief night, I had three morn­ing inter­views — 2 on radio, and one recor­ded for the TV even­ing news. A lovely Lebanese lunch with a group of pro­fess­ors from the uni­ver­sity fol­lowed, and then a much needed chance to sleep it off, before head­ing out to the final gig, organ­ised by Pro­fess­or Graeme Mac­Queen and hos­ted by Mohawk Col­lege. Well, they always say the last one is the best — and I had an amaz­ing even­ing. 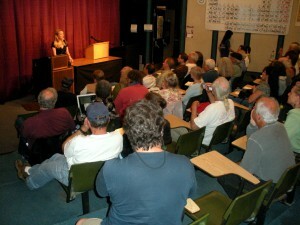 Over an hour of talk, fol­low­ing by 1 1/2 hours of ques­tions from an inter­ested and informed audi­ence. So a great time in an amaz­ing coun­try. Thanks once again to all who made this tour such a suc­cess, and good luck with your future plans! On 22 May I shall be start­ing my very own nation­al speak­ing tour in Canada. 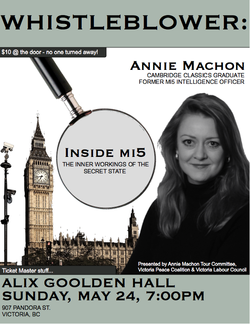 Fol­low­ing my vis­it to Cali­for­nia last year, the Cana­dian 9/11 Truth groups have pulled togeth­er a 7-event tour, where I will have the chance to dis­cuss the intel­li­gence world, whis­tleblow­ing, going on the run and the issue of 9/11, par­tic­u­larly focus­ing on its reper­cus­sions around the world: the end­less “war on ter­ror”, the illeg­al wars in the Middle East, and the erosion of our demo­cra­cies in the West. The Cana­dian Truth Move­ment tire­lessly cam­paigns for a new, inde­pend­ent inquiry in the tra­gic events of 9/11, and has in the past hos­ted speak­ers such as Pro­fess­or Dav­id Ray Griffin and archi­tect Richard Gage. 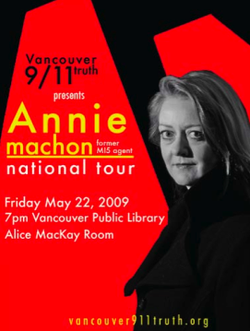 More inform­a­tion about the tour can be obtained from: directors@vancouver911truth.org or elizwood@shaw.ca. See you there! Two meet­ings were organ­ised for me in Mar­in, San Fran­sisco, and Dav­is by the Cali­for­ni­an 9/11 move­ment. They were great meet­ings — packed out — and the response was bril­liant. It’s heart­en­ing that so many people care about these issues, and the adverse impact the “war on ter­ror” is hav­ing, not just on the lives of people in the Middle East wars, but also on our way of life in the West. Two men in black, appar­ently car­ry­ing hand­cuffs, turned up at the meet­ing in Mar­in, sat at the back and spent much of the time mut­ter­ing into their mobiles dur­ing the talk. At the end, while every­one was clap­ping, they sat with their arms crossed, glower­ing at me, and for one mad moment I thought they were going to haul me off for talk­ing in pub­lic about dan­ger­ous notions such as demo­cracy, civil rights and peace. Any­way, thank you to all who made this pos­sible, par­tic­u­larly Gab­ri­el, Kev­in, and Byron. And thanks also to Ken, Hum­mux and the team for film­ing the talk in Mar­in. DVDs of the talk can be obtained here. After the Lon­don event in 2007, Cyn­thia McKin­ney and I flew over to Ams­ter­dam for an inter­view at a big pub­lic event organ­ised by new media organ­isa­tion, Docs at the Docks. Former US Con­gress­wo­man and cur­rent Pres­id­en­tial Green Party can­did­ate, Cyn­thia McKin­ney, vis­ited Lon­don in Septem­ber 2007. I had the priv­ilege of intro­du­cing her at the Lon­don event.